A CreditDonkey.com survey paints one of the clearest pictures yet of the American economy and money mindset on cash savings: On average in 2012, 55.2% of over 1,100 respondents saved less than $100 each month, and an additional 30.2% saved at least $100 but no more than $500. Nearly 15% saved more. And, it's not just the young adults who have little in their bank accounts. The survey found even results across those between the ages of 18 and 44. Of course, people always strive for improvement. 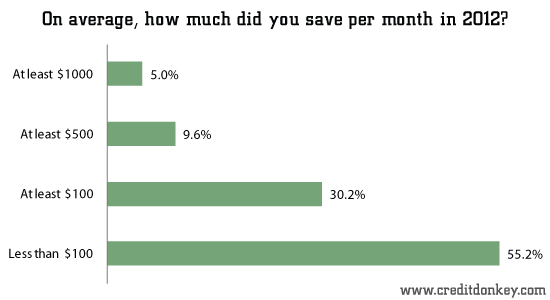 The results were flip-flopped for 2013 savings plans, with 46.8% of respondents planning to save at least $100 but no more than $500, and 33.5% planning to save less than $100 each month. 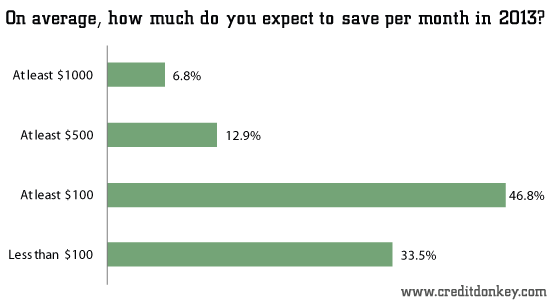 A bigger percentage (12.9%) also have high hopes to save at least $500 per month, compared to 9.5% in 2012 who actually saved that much per month. For those who have trouble sticking with their plans, you may want to take a page from Charles Epstein, author of "Paychecks for Life.” He has a simple savings mantra: "10-1-now." 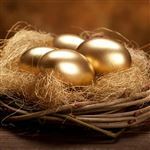 In his book, he says to save 10% of your pay for retirement and if you can't right now, ease into it and increase your contribution by 1% of your earnings each year until you get to there. You could apply the same idea to other savings goals as well. Even scarier: some people have no cash on hand. Another barometer of financial health is cash flow. Our survey found that while 62.4% have at least $100 cash on hand at any one time, almost 40% do not! At the very least, most personal finance experts advise having access to six months’ worth of living expenses. The hard truth is many of us spend more than we earn or come awfully close, according to CreditDonkey analysis of publicly available statistics. In recent years, the median American monthly income has been $4,000, 80% of which goes toward regular monthly expenses like groceries, housing, gasoline, insurance, and the like. Six months’ worth would be $24,000, just to tide you over if you lost your job or got hurt and couldn’t work. People often think if they have a lot of big stuff, such as a house, a flashy car, and even a boat, they are a picture of financial success. But experts say when families have no cash on hand for emergencies, they are one paycheck away from financial disaster. When asked what they would do if they won $500 in the lottery, 64.8% said they would save it. Only 35.2% said they would spend most of it. 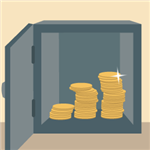 Emergency Fund: Are You Prepared for the Unexpected? Daily, we face the risk of natural and manmade disasters, job loss and medical emergencies. Unfortunately, many Americans have no plans in place regarding these unexpected disasters. This increases the stress they face when disaster strikes. 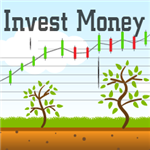 Share on Facebook "Survey: Savings Statistics 2012"